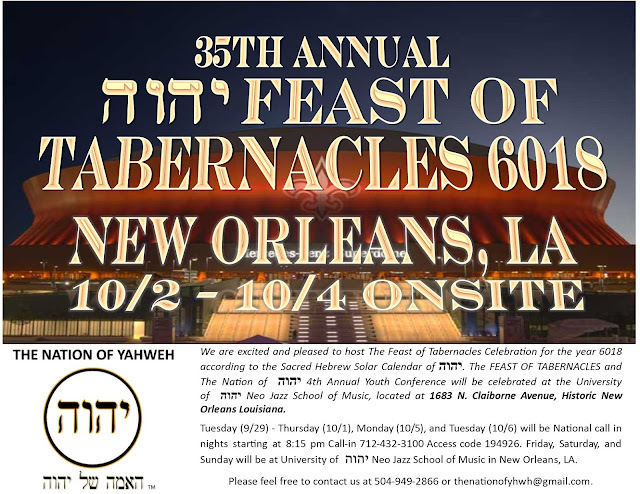 Registration is now open for Feast of Tabernacles 6018 presented by The Nation of יהוה.WeareexcitedandpleasedtohostTheFeastofTabernaclesCelebrationfortheyear6018according to the Sacred Hebrew Solar Calendar of יהוה. 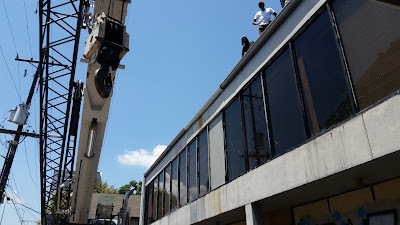 The FEAST OF TABERNACLESandThe Nation of יהוה 4th Annual Youth Conference will be celebrated at the Universityof יהוהNeo Jazz School of Music, located at 1683 N. Claiborne Avenue, Historic NewOrleans Louisiana. Pre-register by September 19th and receive a Free download of Yisrael Trio's GENESIS CD! Thereforeatsundowninthe7thMonth,onthe15thdaythroughthe22nddayinthe year 6018, (September 29 – October 6, 2015), we will observe the Feast ofTabernacles and HolyConvocation. Leviticus 23:34-37 “Speak unto the children of Israel, saying, The fifteenth day of this seventh month shallbe the Feast of Tabernacles for seven days untoיהוה. On the first day shall be an Holy Convocation: ye shall do no servile worktherein. 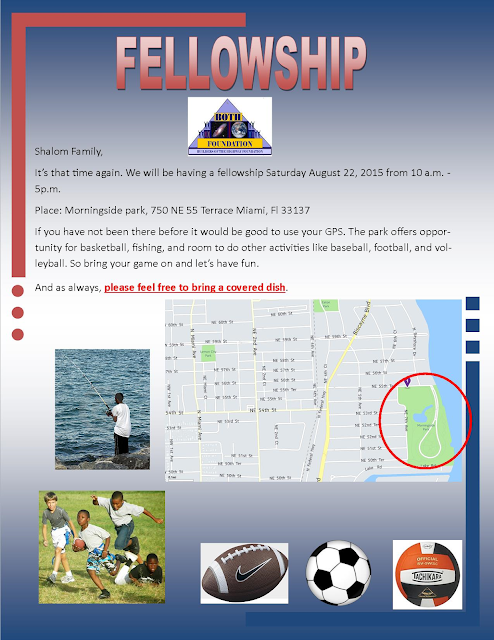 FAMILY FELLOWSHIP IN MIAMI TODAY!! !